D.D. 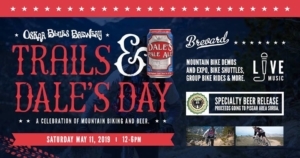 Bullwinkel’s will be setting up at Trails & Dale’s Day – a celebration of mountain biking and beer. Featuring mountain bike demos and a gear expo, group bike rides, trail shuttles, a specialty beer release to raise money for trail building, and more. Special beer release benefitting Pisgah Area SORBA. One fun day of bike riding, celebrating mountain bike culture, and drinking beer!